How can one resist to watch or playback any videos on their Galaxy Note 7? It can play up to 13 hours with it extended battery of 3200mAh, which is more enduring compared to other brands or models of smartphones. The screen size as well as space of storage is even more encouraging for movie lovers. As far as I could recall, Galaxy Note 7 is by the far the smartphone that’s able to playback the most file types out of the popular and common ones. Please continue reading for more information. Please follow HERE for more details into the respective codices that are compatible with the device. Look out for the best video setting for your videos to ensure a smooth, high-quality and enjoyable playback on your Galaxy Note 7. Even though it was claimed by Samsung that the device would be compatible and should support the file formats listed in Part 1, that’s not necessary the case. It’s very frustrating when you’re let down at the very last minute after clicking the PLAY button and get prompted with an error message. Try to get a hold of yourself and DO NOT DELETE the videos just yet! Wondershare UniConverter (originally Wondershare Video Converter Ultimate) will be able to fix it out for you. 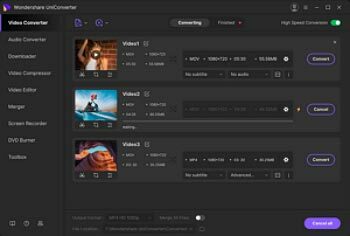 Simply chuck it all in and let it convert your video files for you in batches. It’ll be all done and dusted by the time you come back after a quick coffee or a walk to cool down. Instead of editing, downloading or burning your videos onto a DVD using multiple software, you can do it all in just one single platform with Wondershare UniConverter (originally Wondershare Video Converter Ultimate). It’s also compatible for both your Windows and Mac operating systems. Try it out for yourself. It’ll be more annoying when you have to type in the video settings yourself after being prompted with an error message that your video format is not supported. Hence, it’s more considerate when it’s in a preset for your convenience, just like Wondershare UniConverter (originally Wondershare Video Converter Ultimate). All you have to do is choose your brand or model of device from the built-in preset and it will automatically convert your video files to suit the best playback setting as mentioned in Part 2. If you have any other queries, simply go through our Resource section or get in touch with the Support’s team.